When you’re having a delicious meal, it’s tempting to share with your beloved pet. Wouldn’t Fido enjoy some top-quality steak? Wouldn’t Kitty love licking a bit of whipped cream? While your pets might enjoy these foods, they’re not necessarily good for them. “People food” can create serious health issues for pets. Some foods are outright poisonous to pets. Although your pet might eagerly eat the following foods, they can create negative side effects or even cause death. Chocolate and caffeine. These are toxic to pets due to methylxanthines, which can cause severe hyperactivity, panting, thirst, and abnormal heart rhythms. Berries, grapes, raisins, plums, and peaches. Seeds and pits in these foods can become lodged in your pet’s throat. Some also contain traces of lethal chemicals like cyanide. Milk. Cats and dogs can’t digest lactase, the enzyme that breaks down lactose, so milk products give them diarrhea. Pets can also have dairy allergies, just like humans. Garlic, chives, and onions. This family of foods triggers irritation in the eyes and intestinal tract, which can also lead to asthma attacks, cell damage, and liver damage. Bones and meat. Ignore the nursery rhyme: Don’t give a dog a bone! Bones can splinter and get stuck in the mouth and digestive system. Bones and meat can carry dangerous bacteria too. Avocados. Considered a health food for people, avocados are toxic for cats and dogs due to a chemical called persin. Even a small amount can cause heart problems, breathing issues, mammary gland inflammation, and death. Nuts. Depending on your pet’s sensitivity, even just a few nuts can cause vomiting, weakness, and death. This is especially true for macadamia nuts. Alcohol. All forms of beer, wine, and liquor are hazardous for pets. It might be comical if your dog drinks beer, but it could quickly lead to vomiting, nervous system shutdown, tremors, and death. Watch your drinks during summer barbeques! Some pet owners figure as long as they’re not giving their pets the foods listed above, they’re in the clear. But table scraps also create a dietary issue. Pets can’t handle the calories from rich human food. This leads to obesity and obesity-related health issues. Vets often have to remind pet owners about the moderation problem with giving table scraps. If you offer small scraps of food, so might your spouse or children - even when you’re not looking. Friends and neighbors might share too. Suddenly, your pet is eating hundreds or thousands of extra calories. While you may be sharing table scraps out of love and kindness, the overall effect is negative for your pet’s health. Whether foods are outright toxic or simply too calorie-laden, your pet is at risk for early death. 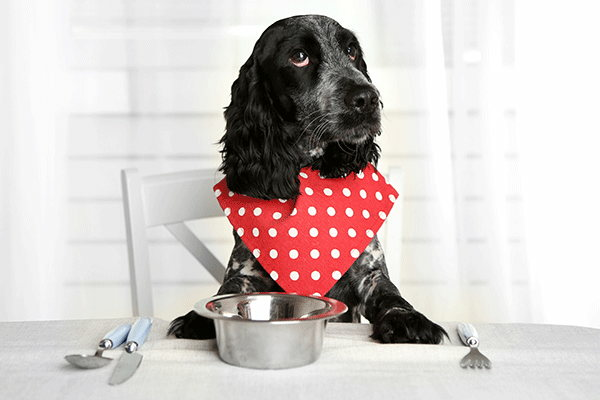 Canine dietician Kristina Johansen describes giving table scraps as good intentions gone wrong. “It's time dog owners stopped killing their pets through misplaced kindness,” she says. Instead of giving your pets human food, try keeping vet-approved treats in a cheerful countertop container. When anyone in the household has the urge to share food, they can give a healthful treat instead. If your pet is on a volume-restricted diet, put a limited number of treats in the container and don’t refill it until the following week. Have additional questions about table scraps and your pet’s diet? Contact Academy Animal Hospital for advice or an appointment.